Methods and certification rules developed by RISE Fire Research in Borås have become both government requirements and public procurement specifications in a number of countries, and present an example of how Swedish innovations can increase safety globally including Protecting Vehicles Against Fires. A large number of bus fires have resulted in the Transport for New South Wales authority electing to install fire-suppression systems in all buses in the region. During the public procurement of the fire-suppression systems, requirements on certifications were made, primarily according to SPCR 183 – which was developed by RISE Fire Research. Fire-suppression systems that fulfil the certification requirements may use RISE’s P-mark as a sign of assured quality. The P-marking process as a whole includes, among other things, the possibility of follow-up spot inspections on installed s. So far, almost 4,000 buses in Sydney have been equipped with P-marked fire-suppression systems. Swedish certification rules for fire suppression-systems in buses and coaches have gained ground as a public procurement requirement not only in Sydney. My next trip to perform spot checks is as likely to be to Dubai, Nevada, or Taiwan. The Washington Metropolitan Area Transit Authority was the first to include P-marking in this type of public procurement in 2014, although they applied these in the form of recommendations. The development of the method for testing fire-suppression systems – SP Method 4912 – that forms the basis of the P-marking process was commenced back in 2011 due to the many bus fires, primarily beginning in the engine compartment. The development work was performed in collaboration with vehicle manufacturers and fire-suppression system suppliers from all over the world. Its purpose was to develop a standardised method of assessing the performance of the fire-suppression systems of buses and coaches in a technology-neutral manner, based on objective, performance-based criteria. The performance of products is tested against realistic fire conditions and environmental aspects that are specific to vehicles. The Swedish Transport Agency assisted with project funding, but its primary contribution was formulating the method and making it possible to implement in international vehicle legislation (UNECE Regulation No. 107). UNECE is the commission of the UN that is responsible for, among other things, vehicle safety regulations in Europe. Two years ago, UNECE passed a resolution on the requirements on fire-suppression systems in buses and coaches; this was through Regulation No. 107, and central parts of SP Method 4912 were used in the specification of the requirements. In practice, this means that there is a piece of EU legislation mandating heavy buses and coaches with combustion engines to be equipped with a fire-suppression system that is tested according to SP Method 4912. Shortly after the requirements were introduced in Europe, they became part of a standard in India as well. However, Israel was actually the first to introduce government requirements, in 2013. Several methods and certification rules have since been created by RISE: The development of a testing method for fire-detection systems in heavy vehicles funded by FFI – Strategic Vehicle Research and Innovation – and a new procedure for testing fire-suppression systems in heavy vehicles other than buses and coaches. This summer, the South African Bureau of Standards placed these methods under consideration, with the intention of soon making it a standard in South Africa. The detection and suppression of an occurring fire is, however, the last line of defence against vehicle fires. In addition to active fire protection, preventative measures should be strongly considered. Vehicle fires are often related to a lack of preventative maintenance, as well as to design flaws wherein fuel and ignition sources are not sufficiently separated. Thus, SP Method 5289 – ‘Fire risk management procedure for vehicles’ – was developed with accompanying certification rules (SPCR 190), as a management system for systematic fire safety work for vehicle manufacturers. The purpose of this was to provide guidance for the carrying out of fire-prevention work. The first commission came from Iran in 2016. At that time, fires in buses were something of a national concern as a result of a number of tragic accidents. Iranian television networks were present when representatives from RISE presented the project plan. The latest development project is taking place in collaboration with the International Road Union (IRU), and has the aim of expanding the concept to also encompass vehicle-operating businesses. A testing method (SP Method 4912) and accompanying P-mark (SPCR 183) that guarantees the quality of fire-suppression systems in the engine compartments of buses and coaches. These form the basis for legal requirements or standards in a growing number of countries – today, over 50. A P-mark (SPCR 199) that, together with SP Method 4912, guarantees the quality of fire-suppression systems in the engine compartments of heavy vehicles. A testing method (SP Method 5320) with an accompanying P-mark (SPCR 197) that guarantees the quality of fire-detection systems in the engine compartments of buses, coaches, and other heavy vehicles. A risk-assessment methodology (SP Method 5289) that, together with the developed P-marks (SPCR 190, SPCR 191) assists vehicle manufacturers and vehicle-operating businesses in maintaining a high fire safety level for vehicles. The interest and success that our projects have received are expressions of the need for standards that address the foremost challenges of our field. Many general standards exist, but there is often a lack of standards that specifically deal with areas that require specialist knowledge. Fires in buses, coaches, and heavy vehicles are potentially catastrophic scenarios that often involve complex causal connections. It is gratifying that RISE can fill this gap and contribute to increased safety as far away as south-east Australia. 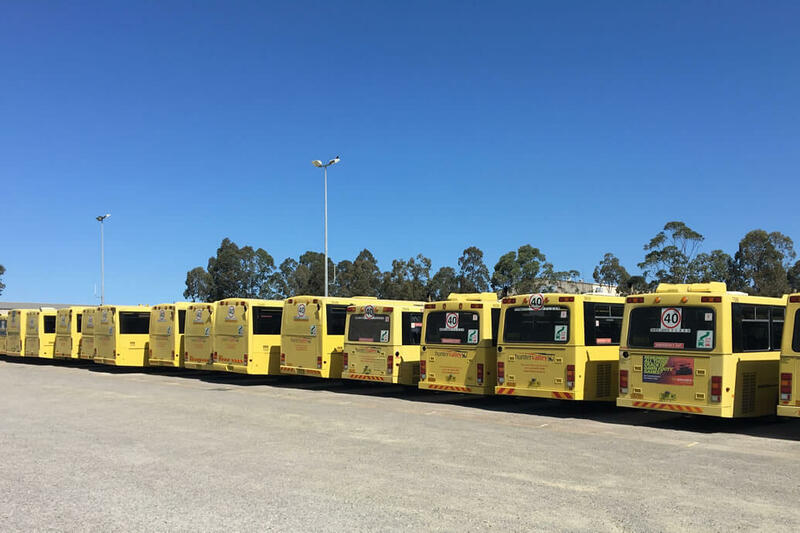 Imgage: Buses and coaches in Australia ready for fire-suppression system inspections. by Max Rosengren, RISE Fire Research.